Family Camp: This Year’s Speakers! Our first Family Camp of the year is in almost one month! We are so excited for the many families that will be here this year and the lots of fun and bonding that will happen! Here are the speakers that will be here for family camp this year! Jonathan grew up in Northern Kentucky and met his wife Jaime at Cedarville University. After graduating and getting married in 2003, they moved to Louisville, Kentucky where Jonathan continued his education at the Southern Baptist Theological Seminary. After completing his Master’s work, Jonathan came on staff at Grace Church in Morton, Illinois in January 2007 as a pastoral intern and became pastor of outreach and discipleship in January 2008. Jonathan and Jaime have three daughters and one son. Jonathan is passionate about connecting people to Christ and to the loving family at Grace Church. When not catching up on yard work, Jonathan enjoys playing basketball, keeping up with his Cincinnati Reds and Bengals, and playing card and board games with his bride. Jeff and Challis Bower celebrated 20 years of marriage this past June, as well as 20 years of full-time ministry service. They have four children age 17, 16, 14, and 12, and have been active foster parents for the past three years. The Bowers love to travel with their kids and experience life in other places. They know there are no perfect families and no perfect formulas for raising kids, but by God’s grace each home can be a safe place and a lighthouse for truth. Jeff serves as the teaching pastor for Highland Gospel Community in Fort Wayne, IN and holds a B.S. in Religion and an M.A. in Classical Studies from Knox Seminary; Challis formerly taught Art and holds her B.A. in Art Education. 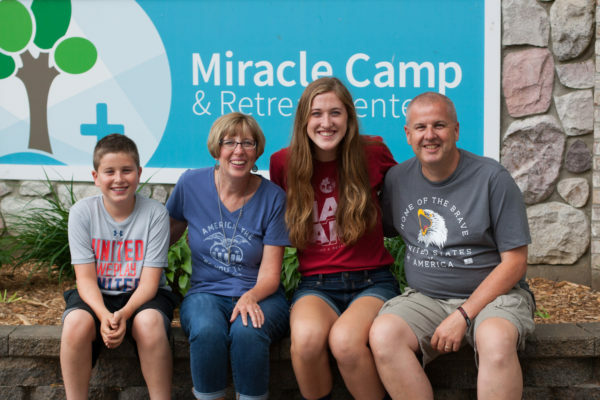 For more information on our family camps, head to www.miraclecamp.com/familycamp!